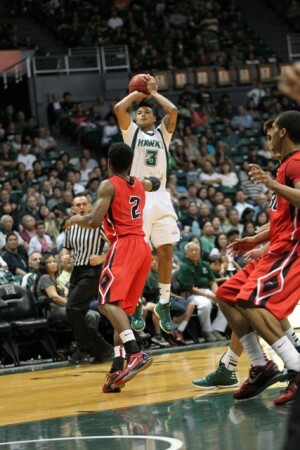 The Hawai’i basketball team will face a titan of a task in its next Big West Conference game – control one of the top offenses in the nation. The Warriors will host Cal State Fullerton in a Big West game on Saturday night at the Stan Sheriff Center. It will be a contrast of styles, with the inside strength of the Warriors going against the outside shooting of the Titans. Interestingly enough, both teams are 7-5 overall and 1-0 in the conference. Indeed, the Titans’ backcourt features the two top scorers in the Big West Conference. Kwame Vaughn, a 6-foot-3 senior, leads the conference with 19.0 points per game; D.J. Seeley, a 6-4 senior guard, is second at 18.4. Vaughn also leads the team in rebounding with 5.2 per game, and is contributing 3.8 assists per game; Seeley leads the team in assists at 4.2 per game, and leads the Big West with 28 steals. The Titans have other weapons, most notably 6-4 senior Sammy Yeagar and 6-1 sophomore Alex Harris. Yeagar is averaging 14.3 points per game and leads the team with 28 3-pointers. He hit eight 3s and scored 30 points in Fullerton’s Big West victory over UC Santa Barbara last week. Harris is averaging 9.8 points per game and is second on the team with 27 3-pointers. Led by its perimeter game, the Titans are currently ranked third among all NCAA Division I teams in scoring at 83.8 points per game. They also rank fifth in free throw percentage at .786, and ninth in 3-point percentage at .409. A key number to watch could be 80 points. Fullerton is 6-0 when scoring 80 or more, and 1-5 when scoring less than 80. The Titans’ weakness happens to be Hawaii’s strength. Fullerton has only one true post player that gets significant playing time – 6-7 junior forward James “Deuce” Johnson is averaging 6.6 points and 2.9 rebounds per game. The Warriors will counter with its “big three” of 6-10 center Vander Joaquim, and 6-8 forwards Isaac Fotu and Christian Standhardinger. Joaquim is averaging 15.3 points and 8.3 rebounds per game, Standhardinger is averaging 15.7 points and 7.8 rebounds per game, and Fotu is contributing 9.9 points and 7.7 rebounds per game. The size discrepancy is evident in the rebounding statistics. The Warriors are averaging 42.6 rebounds per game, and are out-rebounding opponents by an average of 8.9 per game. The Titans are averaging 32.6 rebounds per game, and are getting out-rebounded by opponents by 2.7 per game. Of course, the Warrior guards will have to be on guard, and head coach Gib Arnold again plans to use a rotation of players in the backcourt, including Jace Tavita, Hauns Brereton, Garrett Jefferson, Brandon Spearman, Manroop Clair and Brandon Jawato. The second video above features a recent pregame meal for the team. Chris McMillian, the team’s Director of Basketball Operations, is in charge of setting up the meals before each game. He was able to establish sponsorship deals from several local restaurants to supply food for the team this season. In the above video, the restaurant of the day was Kiss My Grits. Others that have been providing meals this season include P.F. Chang’s and JJ Dolan’s. When: Thursday, Jan. 3, 2013, 7:00 p.m.
Radio: 1500 AM The Buzz will carry the game. Promotions: Toyota Hawaii is the sponsor and will distribute 1,000 Toyota key holder wrist lanyards. Looks like Hawaii’s Bigs against very good Smalls for Fullerton. They have their three guards who average between 14 and 19 pts per game. Fullerton averaging over 83 pt per game. So, Hawaii brings out changing defensives, 1-2-2 zone, Man, Matchup zone, if one Fullerton guard burning them with a hail of threes, the famous Box and one., Defense and good shooting and passing by bigs, along with steady really good guard play gets Hawaii’s 2 Big West Conference win in a row hopefully. I think they will, the effort will be there no question.. Students, we have to come out. at least 4800 to 5000 on Thursday nite, is hard, yet come out of dorms, or drive in from local families homes for this very important game. Thanks Dayton great video. I would start Vander Standhardinger Fotu, Jawato and Clair and sub them out if it is not working out in the first few minutes or before they get tired. Fullerton appears a step up from Northridge, which I thought was well-coached and determinedly played to its strength. As Dayton points out, the three Titan guards — Vaughn, Seeley and Yeager — are all seniors and stand about 6-3, 6-4. Interesting to note that all three transferred from D1 programs — Vaughn from San Francisco, Seeley from Cal and Yeager from TCU — so you know with their maturity and background they won’t be intimidated. Johnson (LaTech) and Harris (Northeastern) are also transfers. As coach Brandyn Akana stated, it’s another matchup of contrasting styles. Looking forward to seeing how this one plays out. And a shout-out to Kiss My Grits, JJ Dolan’s and PF Chang — the players eat better than most of us do! Tonight looks like a Good match-Up and Challenge between the Two Contrasting Styles … Probably the Conference’s Best Back-Court against the Conferences Best Front-Court …(Advantage? The Basket is Closer to and Surrounded by the Front-Court). BC: Obviously, you don’t want to give the game plan away, so this is a tough question, but what does Fullerton need to do tonight to win? In the Fast Fullerton game, do you full-court press a lot ? #1 key to wining tonight…. Roop, Jawato, Tavita, Spearman, Jefferson, must close out hard on Fullerton’s guards and not allow them to catch-n-shoot. 95% of great college shooters drop off significantly if forced to dribble before shooting. It’s ok if Fullerton guards drive in… UH has the size/depth to handle penetrating guards. 3 point shots are contagious and if a team gets hot, they will hit in bunches. I’d rather have Fullerton hit a bunch of 2’s vs a bunch of 3’s. #2 key to victory… dominate the boards. Fullerton has no size or depth at the forwards. Vander, Fotu, and Standhardiger should have a field day tonight. 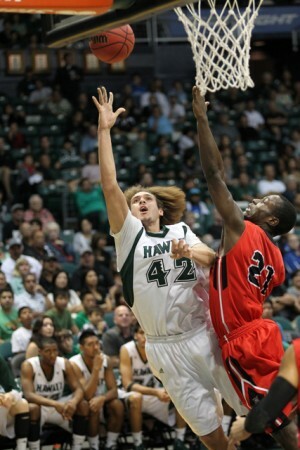 Whenever UH plays a tough opponent… need to change the menu…. What team will want to guard our guys if they reek of garlic and kimchi??? -Take care of the ball! Wouldn’t be surprised if we saw a bit more of Jefferson and Rozitis tonight. Tavita lost his starting role and has since not done anything to earn it back. I attribute their big assist game to the pass and shoot on the perimiter, which we can’t let happen tonight. LET’S GO BOWS! Yes, Aussie Mum and Dad, we young ones, we think you are sitted in rows right behind the Warrior Bench right? You all are wearing dark green Warrior or Warrior Insider T-shirts? Just a guess, you are the ones jumping up and down when UH makes a run, I think. Well we support you, Young students and older post grads, a lot of us love to cheer on team, no matter what really older ones think, we try to be respecful, however, BB team thrives on the vocal support. So Aussie Mum and Dad , thank you for cheering on the team at the DHC!! Unfortunately no – we are not sitting behind the Warriors bench – I wish we were!!!! But you do describe my approach to cheering very accurately!! like you say, TEAM effort for the WIN!